SAFETY (4): Too much traffic, too much weaving. CONGESTION (3): Between the Mississippi River Bridge and just east of Interstate 110 is routinely bad. 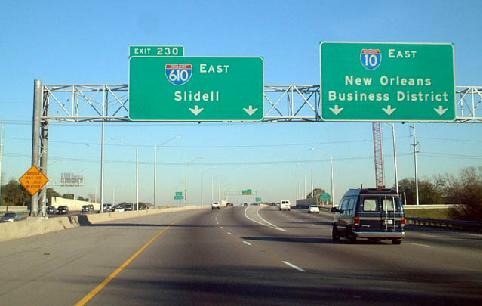 The freeway bottlenecks to four lanes overall through the Interstate 110 south end. Left-hand on and off-ramps complicate that interchange. PAVEMENT CONDITION (9): The LADOT has vastly improved the horrible pavement in the Baton Rouge area. If you asked me this in 1996, I'd have given it a 1. AESTHETICS (7): Most of the frontage consists of sound barriers. The Mississippi River Bridge however offers a fantastic view of downtown. AESTHETICS (8): The 10-mile viaduct over the southern reaches of Lake Pontchartrain is a sight to see. SAFETY (6): The drivers are notoriously bad through here, and given other circumstances, the road is not for the Sunday driver. CONGESTION (6): The Lake Pontchartrain Bridge is only four lanes overall and bottlenecks the otherwise six-lane freeway. PAVEMENT CONDITION (2): I describe the concrete through there as "bone jarring" routinely. AESTHETICS (7): The view of the lake is nice, but through Slidell is ugly. SAFETY (4): Way too much traffic, way to many speeders darting back and forth across lanes. The freeway is way over capacity. CONGESTION (2): Traffic is bad in both directions out of the CBD, especially across the Inner Harbor Navigational Canal and on the stretch from Interstate 610 to the Clearview Parkway exit. The Causeway Boulevard interchange however is the worst to drive through. portion is in good condition as well. AESTHETICS (10): Another great urban freeway.